At the end of the 17th century, Pierre-Charles Le Sueur, a French Canadian fur trader and explorer in the employ of the French explorer d'Iberville, traveled up the Mississippi River seeking copper mines and trading partners. In the fall of 1700, Le Sueur encountered the "Sioux of the West" who demanded that he and his entourage should leave the area. Le Sueur responded that it was too late in the season, and built Fort Vert (also called Fort l'Huillier) near what is now Mankato, Minnesota. At Fort Vert, LeSueur was told about an Ioway village located 80 miles away, near a collection of lakes which drained into a river leading to the Missouri. He sent off a detachment to find them, but they failed to connect. The Ioway moved from the Upper Iowa River to the Iowa Great Lakes region about 1680, and they stayed around 20 years, until just about the time LeSueur went looking for them. Archaeological sites that may represent the remains of their villages have been found along the Little Sioux River between Spirit Lake and the Missouri River. There are 13 known Oneota sites in what is now northwestern Iowa. All of them except Blood Run are in the Little Sioux River drainage. The Little Sioux flows from the Lake Okoboji/Spirit Lake area southwest to the Missouri River. The 12 sites on the Little Sioux are clustered in three groups: one near Cherokee, one near Correctionville, and one near Okoboji/Spirit Lake. It is unclear whether the villages represent migration by a single Oneota group relocating from the Missouri River to the Great Lakes region, or that of several groups in and out of the valley, or both. Many of these sites pre-date the documented Ioway presence in the region, but some may date to around 1700. The earlier sites might represent Ioway ancestors or related groups. The latest sites indicate contact between the Ioway and Europeans, perhaps at first through other intermediary Indian groups. 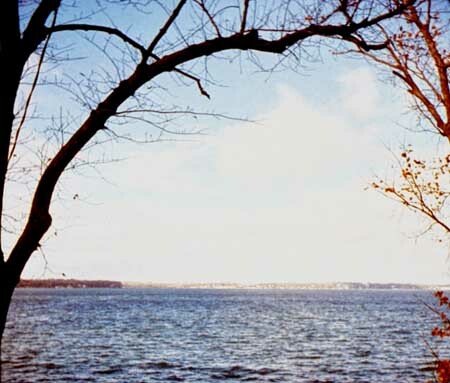 The Milford site is located on a narrow upland divide above a horseshoe-shaped meander of the Little Sioux River in Dickinson County, about 5 miles southwest of West Okoboji Lake. Archaeological investigations at Milford discovered artifacts indicating an early historic Oneota component from ca. 1700. Preservation of plant and animal remains was good. In a cache or storage pit, archaeologists found the remains of bison, deer, and elk, along with corn kernels, nutshells, and a squash seed. A milling slab and stone were found, along with a range of battered cobbles and anvil stones used in food processing. Several bison scapula hoes were found, as were corn shellers made of bone or shell. Pottery designs at the Milford site are similar to Allamakee Trailed of the Orr phase. Catlinite pendants and a catlinite effigy were found and also suggest a post-1400 date. Confirming the early historic dating are trade goods including gun flints, metal axes, knives, brass kettle fragments, lead shot, and Jesuit rings. Gillette Grove is located on a nearly level upland above the Little Sioux valley in Clay County. Excavations recovered classic Allamakee Trailed pottery:shell-tempered pots with intricate shoulder designs of punctate-filled chevrons bordered by vertical lines. Other artifacts found at Gillette Grove are triangular chert and metal arrowheads, sandstone abraders, metal rings or coils, worked catlinite, and fragments of thin copper or brass. 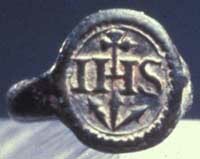 Jesuit rings and glass trade beads suggest a date of around 1700; oxidizable carbon ratio (OCR) dating rendered a date of around AD 1540. 1995. The Ioway Indians. University of Oklahoma Press, Norman. 1999. Oneota in Northwest Iowa. In Bison Hunters of the Western Prairies: Archaeological Investigations at the Dixon Site (13WD8), Woodbury County, Iowa. Richard L. Fishel (ed). Report 21, Office of the State Archaeologist, The University of Iowa, Iowa City. 2002 The Reliability of Surface Assemblages: Recent Results from the Gillett Grove Site, Clay County, Iowa. Plains Anthropologist 47(181):165-182. 1993 The Milford Site (13DK1): A Postcontact Oneota Village in Northwest Iowa. Memoir 27, Plains Anthropologist 38(145):283-306.